Our personalized soft fleece 30x40 blanket will be treasured for years to come, available in plain fleece or minky fleece. If you're looking to give that special Baby Shower or New Baby Gift that's over the top - this is it! The blanket is personalized with baby's name. Available in flat soft fleece or minky plush fleece, our blanket is a large 30" x 40" size - the perfect receiving blanket. Our fleece material is breathable & comfortable for baby, and folds flat for easy storage. The personalized baby name and design is permanently printed with water based ink & will not wash out or peel - machine washable (no bleach). Blanket back is plain white as shown. 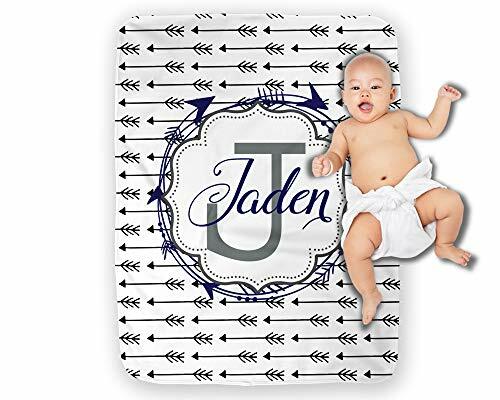 Not only is the blanket comfortable, but it makes an amazing custom photo backdrop to document your babies growth! View More In Handbags & Shoulder Bags. If you have any questions about this product by Right On The Walls, contact us by completing and submitting the form below. If you are looking for a specif part number, please include it with your message.